There is no cure for asthma. Some asthma flare-ups can be prevented. Asthma can be treated with lifestyle changes and medication. Untreated asthma can become severe and life threatening. People can control their asthma with self-management and medical treatment. Most people with asthma can lead normal lives. Your lungs are located inside of the ribcage in your chest. Your diaphragm is beneath your lungs. The diaphragm is a dome-shaped muscle that works with your lungs when you breathe. Once in the lung, the bronchi branch off throughout the lung and become smaller. These smaller air tubes are called bronchioles. 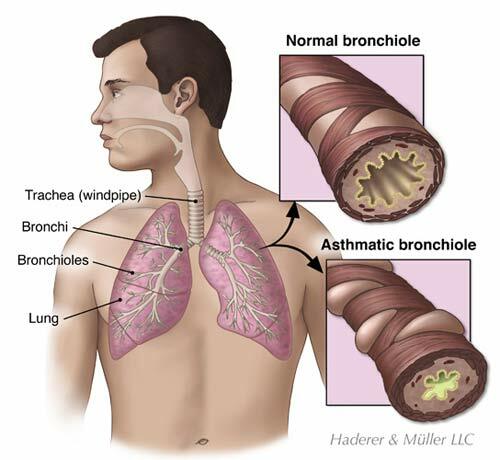 There are approximately 30,000 bronchioles in each lung. The end of each bronchiole has tiny air sacs called alveoli. There are about 600 million alveoli in your lungs. Each alveolus is covered in small blood vessels called capillaries. The capillaries move oxygen and carbon dioxide in and out of your blood. 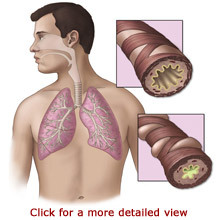 Asthma causes the bronchial tubes in the lungs to swell and become narrower. The muscles in the airways contract causing even further narrowing. The bronchioles may also produce extra sticky secretions or mucus. Asthma makes it harder for a person to inhale or exhale. Asthma makes it difficult to breathe. You may have to work extra hard to breathe under normal conditions. You may experience shortness of breath that is made worse by exercise. You may hear a wheezing sound when you breathe. Wheezing sounds like a whistle or high pitched musical noise. It is caused by air being forced through the narrow airways. Wheezing usually begins suddenly. It may come and go. It may occur more often in the night or early morning hours. Cold air or exercise may cause wheezing to increase. Wheezing may be accompanied by a cough. It is important to note that not all people with asthma wheeze, and not all people who wheeze have asthma. You may also experience nasal flaring, chest pain, or chest tightness. It may take you longer to breathe out than it does to breathe in. You may have an uneven breathing pattern with temporary stops. It may be difficult for you to speak. Symptoms of severe asthma are signs of a medical emergency and may lead to death without treatment. You should call emergency medical services, or have someone drive you to a hospital emergency room if you experience an extreme difficulty with breathing. Other emergency symptoms include sweating, a rapid pulse, and anxiety associated with shortness of breath. Additionally, your lips and face may appear blue. Your doctor can diagnose asthma by reviewing your medical history and conducting a physical examination and tests. You should tell your doctor about your symptoms, risk factors, and what appears to trigger your asthma flare-ups. Your doctor will listen to your chest while you breathe. If you are experiencing an asthma episode, your doctor may hear wheezing. However, wheezing is not present between asthma flare-ups. There are several tests that your doctor may conduct to find out the cause of your symptoms and the degree of your airway obstruction. Your doctor may also order a chest X-ray to rule out other conditions that have similar symptoms. Your doctor will have you breathe into a hand-held device called a spirometer. A spirometer measures how much air you breathe out and how forcefully you breathe the air out. Your doctor will also have you breathe into a peak flow meter. A peak flow meter is a hand-held device used to manage asthma by monitoring the airflow through your bronchi. The peak flow meter measures your ability to expel air from your lungs under the best or peak conditions. Your rates will be higher when you are feeling well and lower when you have an asthma flare-up. By monitoring the changes in your breathing patterns your doctor can identify how well your lungs are functioning, the severity of your symptoms, and appropriate treatment. Your doctor may take a sample of your blood to determine the amount of carbon dioxide and oxygen in your blood. A blood test may also be used to identify infections or other causes of your symptoms. Additionally, a blood test or skin test may be used to determine the type of allergies that you may have. The goals of asthma treatment are to establish normal lung function, relieve symptoms, and prevent asthma flare-ups. There is no cure for asthma, although symptoms may decrease over time. It is important to identify and avoid the allergens that trigger your asthma. Your doctor may prescribe medications based on your condition. The type of medication that you receive depends on the severity of your asthma, the cause of your symptoms, and your lung functioning. You may receive long-term medications or quick relief “rescue” medications. Long-term medications are used on a regular basis to prevent asthma. People with persistent asthma flare-ups use long-term medications to prevent symptoms. Quick relief medications are used during an asthma flare-up to relieve symptoms. People with Mild Asthma or infrequent flare-ups may use quick relief medications as needed. Your doctor will instruct you how to use a peak flow meter at home. By measuring your lung volume, you may be able to detect an upcoming asthma flare-up and take action according to your doctor’s instructions. Using a peak flow monitor can prevent an asthma flare-up from taking you by surprise. You should wear a MedicAlert bracelet and carry a MedicAlert card in your wallet. In the case of an emergency, the MedicAlert information will be helpful to the healthcare professionals treating you. Because the medical complications associated with asthma can be very serious, people with asthma need to diligently manage their condition to remain healthy. You should formulate a plan with your doctor as to what you should do in the case of an emergency or serious situation. You should know how to use your medication properly and when to use it. You should also know what to do if your medication does not work right away and when to go to the emergency room. You may be able to prevent or reduce your asthma flare-ups by avoiding the triggers that cause it. Talk to your doctor to find out if allergy treatments are an option for you. You may also make lifestyle changes to protect yourself from allergens. This may include staying indoors when pollen levels are high or removing carpets from your home. Ask your doctor for recommendations that are appropriate for you. Learn how to use a peak flow meter at home. Check your peak flow regularly. Keep a record of your results and bring them to your doctor appointments. The record will help your doctor to monitor your medications. Additionally, make sure that you attend all of your doctor appointments. _____ Smoking or living with a smoker can increase your risk because smoke is unhealthy for the lungs and can be an asthma trigger. _____ A family history of asthma. If your parents, brothers, or sisters had asthma, you have an increased risk of developing it as well. _____ If you have allergies or eczema, a skin condition, you have an increased risk of developing asthma. _____ If you had allergies or a severe viral infection before you were three years old, you are at risk for developing asthma. _____ Living in the inner city or being exposed to mice and cockroach waste products increases your chance of developing asthma. _____ If you are frequently exposed to triggers, you are at risk for asthma. Complications from asthma can lead to hospitalization and even death. You may be hospitalized if your asthma is very severe or does not respond to treatment. You may be hospitalized if you develop a serious lung illness or a pneumothorax, a collapsed lung. Other conditions that warrant hospitalization include poor lung function and elevated carbon dioxide or low oxygen levels in the blood. The hospital staff will monitor and treat your condition. Some people may have to be placed on a ventilator, which is a machine that can breathe for them.